President Trump's last-minute demands for billions in border wall funding triggered the partial federal government shutdown that closed national parks and facilities late last month — but his namesake hotel in the nation's capital will see its own National Park Service site reopen this week. The Old Post Office Tower, which shares facilities with the Trump International Hotel on Pennsylvania Avenue, is slated to reopen by Friday thanks to funding from the General Services Administration. GSA owns the facility, which once served as the headquarters of the U.S. Post Office. The agency inked a 60-year lease with the Trump Organization in 2013 to open a hotel on the site, including maintaining public access to the 270-foot observation tower. The National Park Service provides interpretative programming at the site, which includes self-guided tours and an exhibit area. 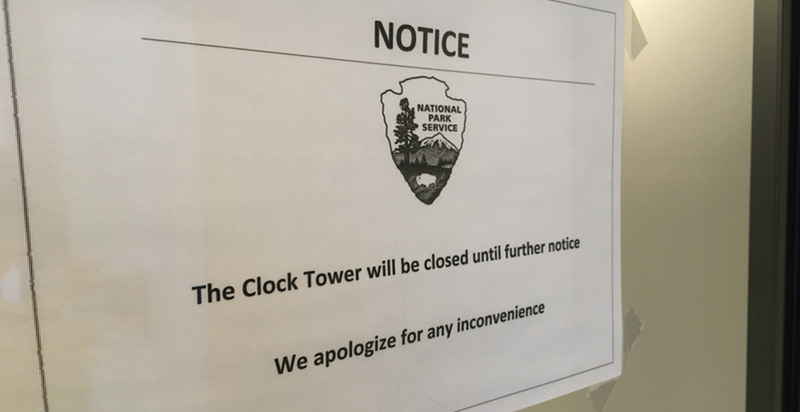 Access to the tower closed Dec. 22 when Congress failed to reach agreement on funding for agencies including the Interior Department. An Interior spokesman said the agency vowed to maintain access to "iconic areas," but that apparently did not include the Old Post Office site (Greenwire, Dec. 26, 2018). NPS chief spokesman Jeremy Barnum last week declined to speculate on whether the Old Post Office Tower would be reopened but noted that the agency had signed more than 40 agreements — with concessionaires, partner organizations and state governments — to continue operations at parks and other sites. "The extent of services and duration varies by agreement," Barnum said in an email. Those agreements range from Guest Services Inc. providing portable toilets on the National Mall to Xanterra Parks and Resorts paying for the grooming of roads in Yellowstone National Park. Both the Utah and New York state governments have also provided funding to maintain national parks and monuments inside their borders. According to Utah Office of Tourism Associate Managing Director Jay Kinghorn, his state paid nearly $55,000 to provide visitor center and janitorial services at Arches, Bryce Canyon and Zion national parks between Dec. 22 and Dec. 31, 2018. Similarly, New York Gov. Andrew Cuomo (D) said last month that the Empire State would pay about $65,000 per day to open the Statue of Liberty National Monument and Ellis Island. GSA did not detail how much it will cost to cover operations at the Old Post Office Tower. According to the NPS contingency plans for a budget lapse, individual park units can enter into agreements with "local governments, cooperating associations and/or other third parties" to continue "specified visitor services." It is not clear whether the Trump Organization attempted to pay to reopen the facility itself. Multiple telephone calls and emails to representatives of Trump Hotels were not returned. According to the GSA lease for the facility, while Trump Hotels must maintain public access to the tower, the business is responsible for the entire Post Office site. "For the avoidance of doubt, the Clock Tower Space is part of the Premises ... for which Tenant is responsible," the lease states. In the meantime, the Washington Ringing Society will mark the start of the 116th Congress tomorrow by raising the historic Congress Bells inside the tower at 7 p.m.
"Because this is a performance outside of National Park Service hours, visitors in the ringing room are not permitted, but the bells can be heard by the public from outside the Old Post Office Tower," said Ringing Master Robert Bannister.